Spell Out Names and Special Messages! Use with BE1256 to make friendship bracelets. Approximately 225 beads per bag. 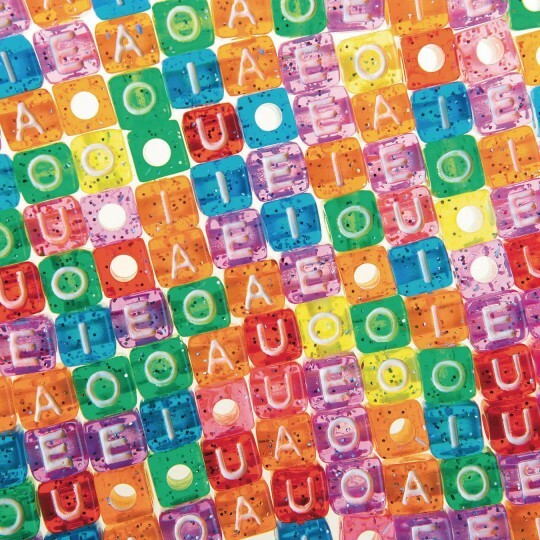 Spell out names and special messages with colorful vowel beads! 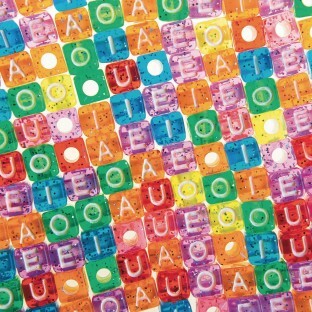 Use with BE1256 Alphabet Beads to make fun friendship bracelets to share and wear! Beads are 7mm with 4mm holes. These letters are a larger size than most of the other letters I find out there. HOWEVER this set is absolutely perfect for finishing popular words. I am forever running out of vowels. These vowels are well printed and an excellent quantity and quality. Children loved using this at Kindergarten Boot Camp! we always need extra vowels for name bracelets thanks! summer camp name bracelets: never enough vowels in a bag of alphabet beads these are a great addition to my bead box. I was glad to find these vowel only beads! They are so hard to find and I have an overload of consonants. Plus they are super pretty and standard size. We love that you can buy only vowels to go with the letters we still have. The letters do not rub off like others I have bought. Easy for the kids to use and colorful.